The Corps’ regional flooding study is attacked in the Chronicle by the West Houston Association, which just wants to get on with digging up the bayou so that more development of the prairie in West Houston can happen and send more runoff faster into our already overburdened federal flood control dams. SBB writes a Letter to the Editor defending the Corps’ very sensible project to figure out what and where our problem is and then we went on the radio to talk about it. Result: West Houston Association drops impractical and unworkable idea of deepening and widening the entire length of Buffalo Bayou from below Beltway 8 to Shepherd Drive. But the bad idea stays alive. See below. SBB reports that the regional flooding study has received federal funding and interviews the Deputy District Engineer Edmond Russo, of the Corps’ Galveston District, about it and the potential for shifting the focus of flood risk management from speeding up to slowing the flow – in line with modern practice. Boy Scout Austen Furse begins his Eagle Scout project planting buckets of eastern gamagrass around the massive stormwater outfall, still a boat launch, that was once a nature trail in Memorial Park at Woodway. Unfortunately this news is overshadowed by the discovery that a rogue biker had ripped out vegetation and built a wooden bike ramp/jump on the edge of the high bank where SBB has been documenting A Bend in the River for the last four years. Removing vegetation, pounding the high bank seriously damages the soil structure and integrity of the bank. Result: SBB complains, bike jump is removed, bank is restored, bikers mad, and gamagrass grows almost as fast as the Boy Scout who planted it. A lesson in good and bad stewardship of the bayou. 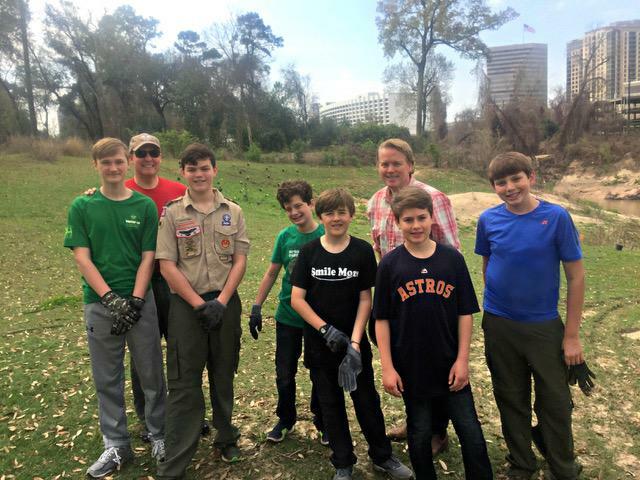 Boy Scout Austen Furst and his fellow scouts in March 2018. Also in March, SBB reports on an important study by hydrologist Matthew Berg documenting the astonishing increase in stream flows in Harris County, including streams flowing into the overburdened Addicks and Barker reservoirs. The threat of catastrophic overtopping and potential dam failure forced the Corps of Engineers to open the floodgates on these federal flood control dams during Harvey, resulting in disastrous flooding on upper Buffalo Bayou. Spring arrives and we are able to take our seasonal photo of our beloved bend in the bayou without the disfiguring and unauthorized wooden bike ramp in the picture. SBB participates in Earth Day at Discovery Green. 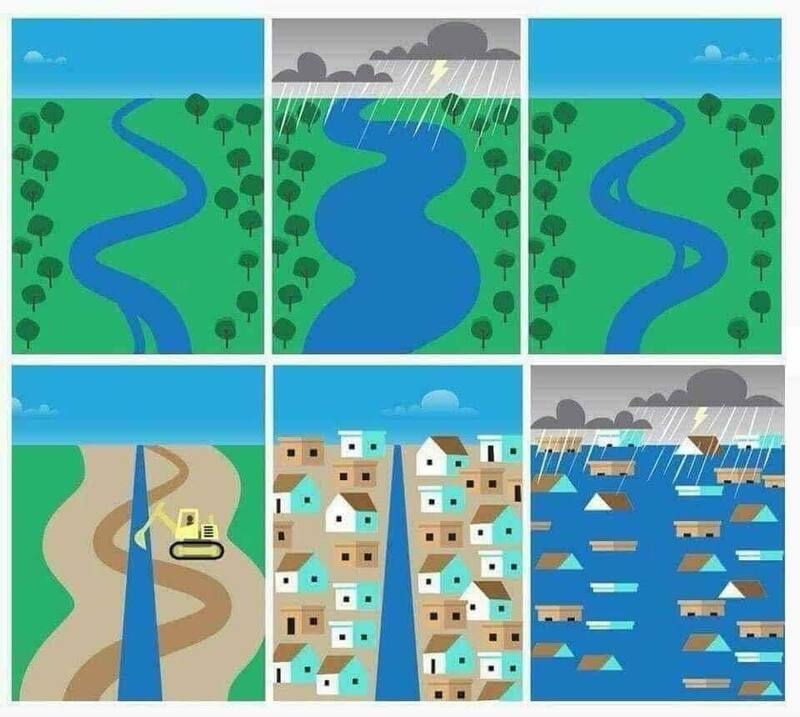 Scientific American publishes a report, using the example of the Mississippi River, on why “improving conveyance” doesn’t reduce flooding but causes more flooding, and SBB tells people about it. This article and other useful books and articles, including the Berg streamflow study mentioned above, are all linked on our website page Books and Articles on Buffalo Bayou, Rivers, Flooding, and Nature. A controversial proposal to build a residential development on a former golf course urgently needed for stormwater detention on Brickhouse Gully in west Houston provokes a dispute over what the City and County can/can’t and should do about development. SBB writes that in fact both the City and County have the power of eminent domain, a legal tool used elsewhere to protect land from development and create parks and green space, and that they could use it if they wanted to. But they don’t. The Harris County Flood Control District revives its unpopular plan to remove trees and scrape out small detention basins to capture overflow from upper Buffalo Bayou in Terry Hershey Park, and SBB protests. The district also releases its list of proposed projects to be funded with $2.5 billion in bond funds should voters approve the bonds in August. The agency solicits comments and begins holding community meetings on citizen concerns and priorities. Included in the bond project list is $10 million to build the unpopular detention basins. SBB participates in the WaterWorks Water Festival sponsored by the City of Houston WaterWorks Education Center. The Chronicle publishes our editorial about using eminent domain to preserve land needed for slowing, holding, and absorbing stormwater runoff. But more and more land in critical areas continues to be approved for development by both the City and County. SBB investigates and publishes a report critical of Flood Control’s outdated and destructive debris management practices on Buffalo Bayou and elsewhere in the wake of Harvey. 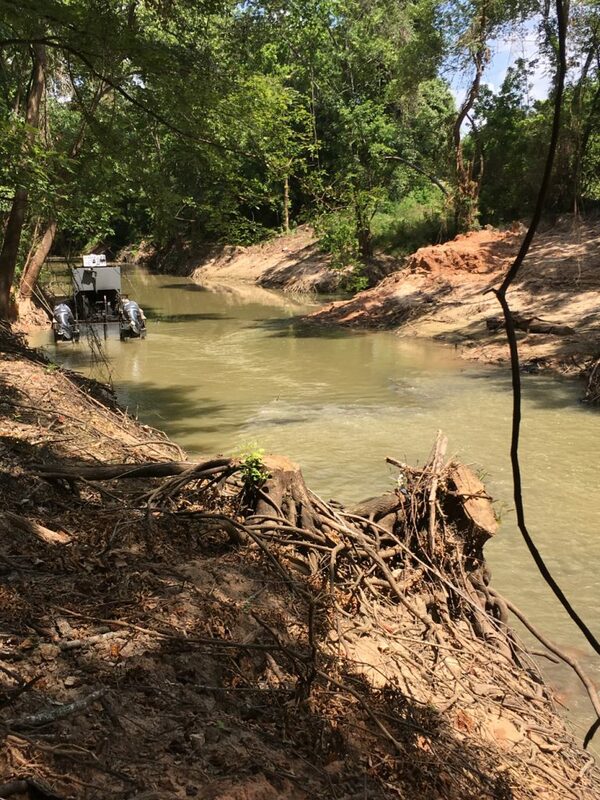 Contractors, paid by the pound, have been cutting live trees, digging up and running heavy equipment over the banks and channel, and stripping all of the large woody debris from the banks, which leaves the banks vulnerable to erosion and results in increased sediment flowing downstream. Modern, science-based practice is to leave some large woody debris strategically placed against the bank. Result: A maintenance subcontractor is removed from the job and at least one fallen tree, possibly others, is left properly placed parallel to bank. However, the flood control district continues to cut down trees and vegetation on channel banks as a matter of policy, despite the fact that doing so causes banks to collapse and increases erosion and sediment in the stream. We continue to look into this and will have a new report very soon. In a separate report, which also found opportunistic and unnecessary cutting of live trees on Buffalo Bayou in Terry Hershey Park, SBB questioned the need for shallow detention basins along the straightened channel in the 6-mile long park below the dams since it appears that swales and oxbow remnants of the original channel already exist there. The flood control district and county commissioners continue to hold public meetings on the bond proposals, listening to citizens’ concerns about flooding and drainage. A topic of concern: the erroneous belief that the meanders of Buffalo Bayou below Beltway 8 are like “kinks in a hose” causing flow to back up and flood property above Beltway 8. Straightening the meanders, deepening and widening Buffalo Bayou remains a priority for many who blame the bayou for flooding their homes. The Memorial Examiner publishes a report on Flood Control’s stream maintenance practices, quoting Save Buffalo Bayou. Henry Grabar of Slate writes an excellent article about flooding in Houston quoting Save Buffalo Bayou. Five months later, in January 2019, he writes another well-researched and highly informative report on the big flood-diversion tunnel in Chicago and why that hasn’t worked. Building a giant stormwater tunnel is an idea proposed in Houston. After a long investigation, Save Buffalo Bayou publishes an in-depth report on “Who Owns the Bayou? 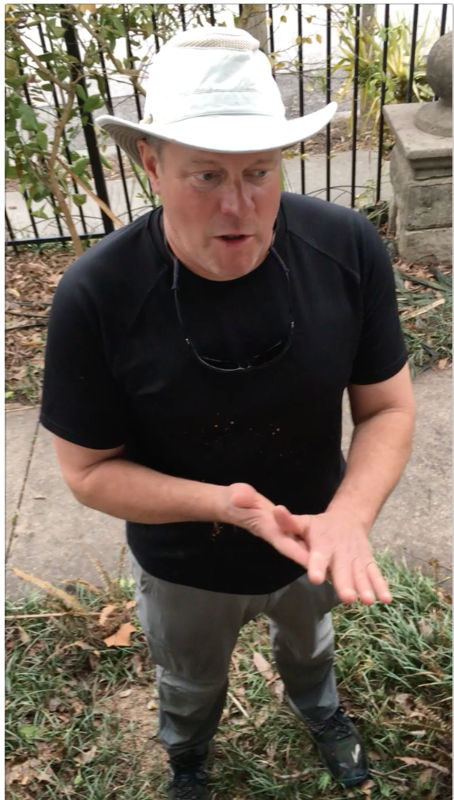 Rights, Responsibilities, and Flooding Your Neighbor.” The article is a response to numerous damaging erosion control and landscaping projects on Buffalo Bayou, a public waterway. The report clarifies the property line between private and public ownership and the responsibilities and enforcement powers of public agencies like the City and County engineering and floodplain management offices, Harris County Flood Control District, the state and the federal government, in particular the Corps of Engineers. 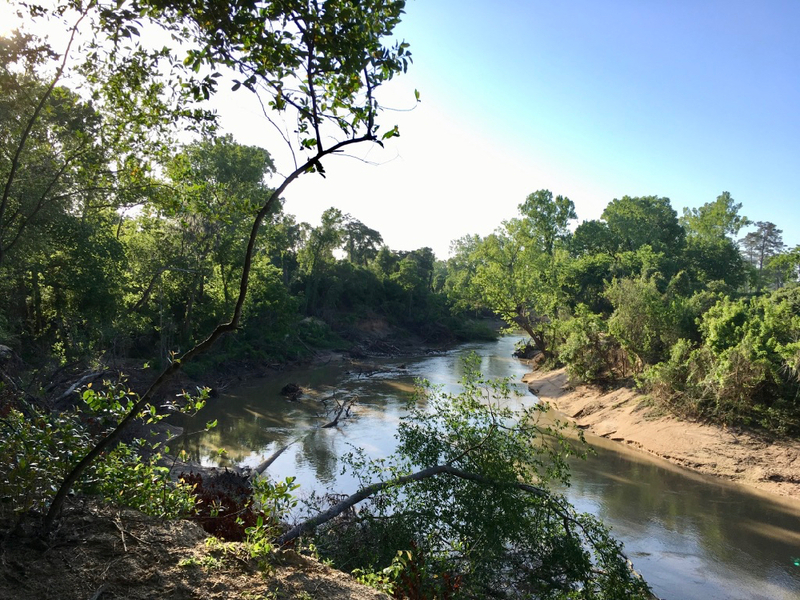 Save Buffalo Bayou commissions a study and publishes a report on the highly emotional issue of meanders and flooding on upper and lower Buffalo Bayou. The conclusion: meanders do not cause property to flood upstream of Beltway 8 adjacent to Terry Hershey Park. But straightening that upstream stretch of the bayou by the Corps of Engineers in the Forties made future residents more vulnerable to flooding. 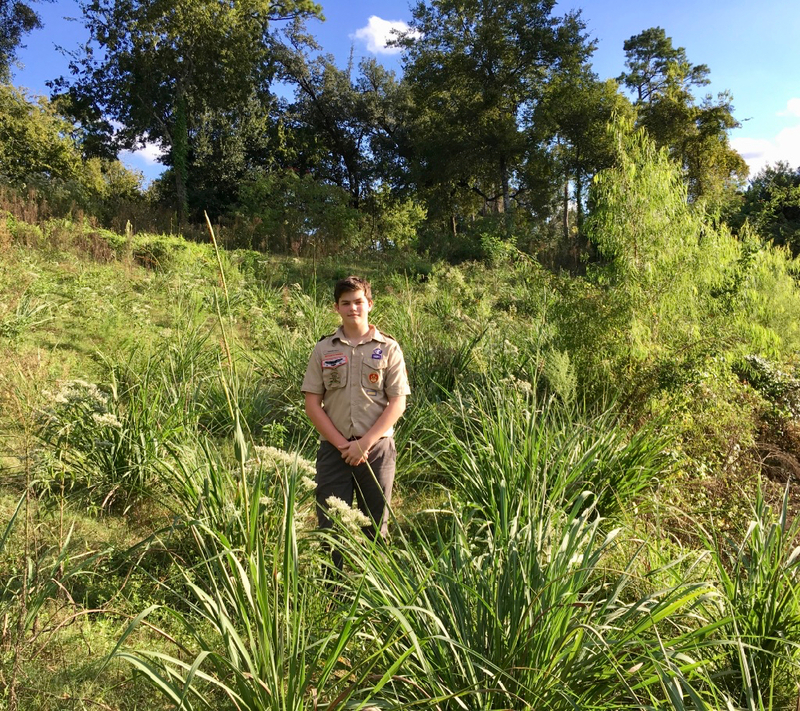 Also in October, SBB checks in on the progress of Boy Scout Austen Furse and his gamagrass project. Both have grown taller. Austen Furse surrounded by gamagrass and willows on Oct. 14, 2018. Photo not by his mother. Save Buffalo Bayou advisory board member Janice Walden floats down Buffalo Bayou with wildlife photographer Greg Lavaty. Photographer Jim Olive, also a member of Save Buffalo Bayou’s advisory board, takes the fall 2018 photo for our series, A Bend in the River, and comes across a huge beautiful coral snake slithering across the path. 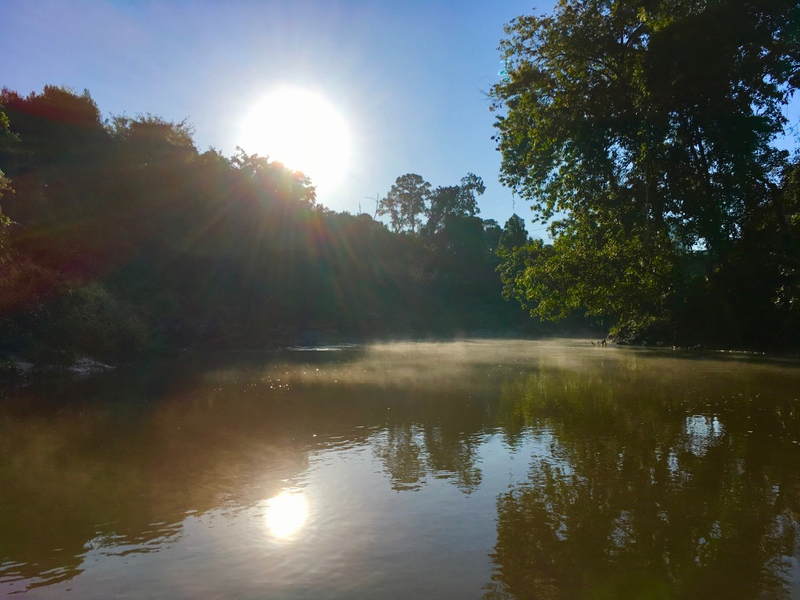 A nine-minute film of a sunrise paddle down Buffalo Bayou shot in late November. Harris County Commissioners’ Court approves a $350,000 contract to study the placement of large concrete culverts to bypass meanders in 13 locations on Buffalo Bayou. The contract, awarded to Huitt-Zollars, will also focus on the impact of 33 bridges and 4 pipelines crossings on the flow in the bayou. A study commissioned by Save Buffalo Bayou has already determined that the meander bypasses are likely not feasible. 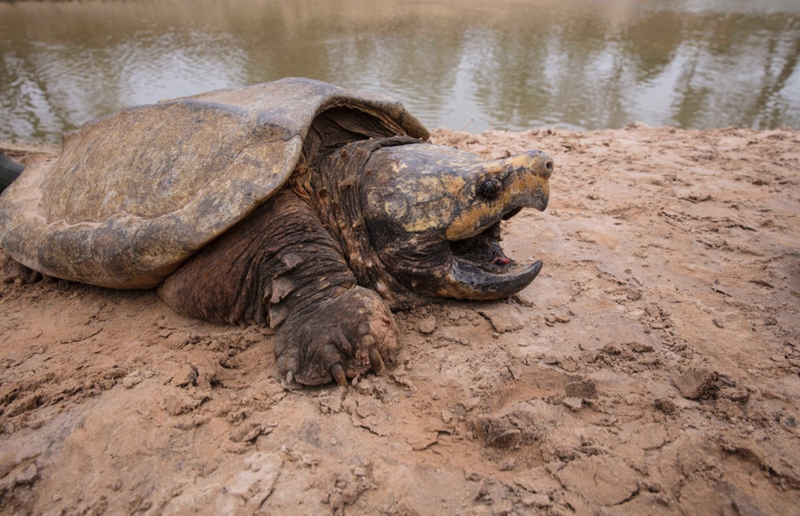 The Chronicle reveals the not-so-secret secret of ancient alligator snapping turtles, a threatened species, in Buffalo Bayou. Environmental groups, including Save Buffalo Bayou, respond to a draft feasibility study and environmental impact statement for a Texas Coastal Plan. The plan would attempt to protect the upper Texas coast, including Galveston Island, the Houston ship channel, port, and refineries as well as downtown Houston from rising sea levels and a storm surge through Buffalo Bayou. The environmental groups urged greater emphasis on green, nature-based solutions, as well as greater responsibility from industries, among other issues. Public comments on the draft study are due by Feb. 8, 2019.